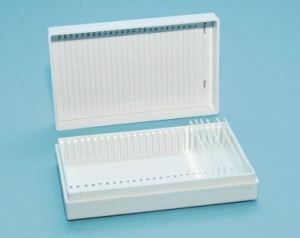 Agar Scientific offers a wide range of storage boxes for microscopy slides and samples. These include slide boxes, storage boxes for large slides, clear polystyrene boxes with Platilon membranes in round, square or rectangular shapes, clear round polystyrene containers, clear square polystyrene containers, small boxes and tubes, hinged styrene storage boxes, wafer trays, and plastic boxes with hinged lids and fixed compartments. Agar's slide boxes are injection-moulded, high impact ABS plastic boxes that are compact, indexed and durable. The units are stackable, and are ideal for protecting microscope slides in a busy laboratory. The walls of the boxes do not crack, warp or splinter, and the material is not affected by humidity. Agar also offer specialist storage options, such as the AGL4526 storage boxes for large slides, which are manufactured from heavy cardboard with lid. AGL4528 and AGL4529 slide boxes are made from durable hardwood and can hold 100 slides of 38 x 75mm or 50 x 75mm. Clear polystyrene boxes with thin Platilon membranes are suitable for the safe transit of delicate objects. They are available in various shapes and sizes. Wafer trays are particularly designed for the storage and transport of semiconductor wafers and other delicate objects. They are manufactured from polypropylene.